His personality is shining, and we are bonding more than ever. I feel like I finally know this boy! I have so much to say this month and hope I can remember each and every detail! Finn definitely knows his name and always turns his head as soon as he hears anyone call for him. He is a happy and friendly baby, but we are also in the stranger-danger stage. Conor is by far his preferred parent still. It's nice to share baby duties and not feel like Finn solely relies on me. Eating: Finn doesn't have much of a solid food appetite yet, but he is a lover of mandarin oranges and cheerios. He seems to still love pork and is getting into hummus. He's also a big fan of yogurt. However (and it's a big however)... We think Finn may be a little allergic to dairy. 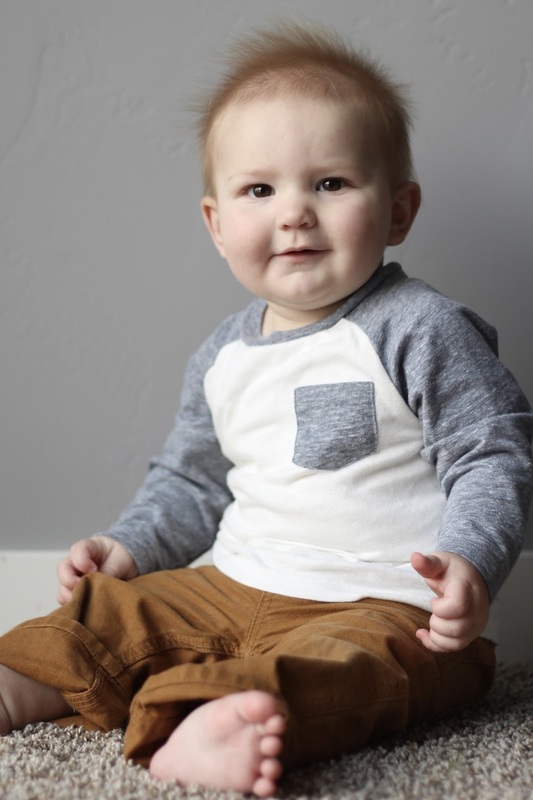 Since he's been 6 months old, Finn has suffered from some pretty bad eczema on his abdomen and thighs. It seems to only be getting worse but there are good days and bad days for his skin. I'm trying to figure out if I can eat, if he can eat, or if dairy isn't the problem and it's something else entirely. It's been quite frustrating. I plan on making a trip to the allergist to try and sort all of this out! Our breastfeeding relationship has entered the fun new stage where gymnastics are involved. Finn prefers to try and stand up in bed while he nurses. This is adorable and infuriating all at the same time! Sleeping: He had a big growth spurt this month, which made for some long long nights. He wanted to be latched on nearly the entire night. We are just starting to come out of that phase. I'm thrilled when he sleeps a four hour stretch, ha! A very similar sleeper to his big brother, so all these night wakings have been expected. Cosleeping works so well for us. I love having Finn right next to me. I can quickly nurse him and we are both right back to sleep. He takes two naps a day, although the morning one is usually in the wrap while we are out & about! Likes: Big brother is still his most favorite thing, but this month has also brought an interest with toys. He will sit and play alongside Liam, often wanting to do exactly what big brother is doing. He loves banging things together, or banging things on a table. Lots of banging. Finn is loud and likes to make loud noises. He also has this signature move of nuzzling his head against the face or neck of whomever is holding him. It's this sweet little nudge that we know is his cute little way of showing affection. Milestones: Finn is officially crawling!!! (Trying to take his monthly picture with him just sitting was quite difficult)... Just as I predicted, he was mobile right before Christmas. After just a couple weeks of moving around, he has picked up speed and can now make his way around a room rather quickly. The baby gates for the stairs are going up tonight. Liam was a late crawler, and barely crawled at that, so this is a bit of new territory for us! Finn is also pulling up on furniture and trying to stand by himself every so often. I'm guessing he will be an early walker like Liam who hit that milestone at 10.5 months. We shall see! Nicknames: Finnier, Finnaroo, Finner, & Huck. Finnaroo seems to be the most popular. 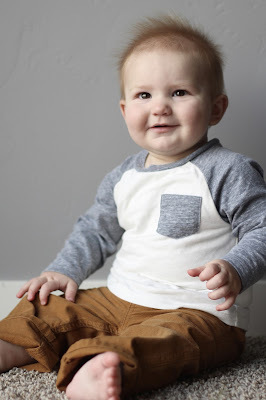 He is this big boy (seriously) who seems to be heading toward toddlerhood far too quickly. He wants to be able to keep up with Liam and always be in the action. He is a determined boy who knows exactly what he wants, and gets quite upset when he can't get his hands on the things he wants. Life just continues to be more fun with him in our family! I am completely enjoying this stage of his life and not wishing it away or being anxious for the next steps. Life is good in our home right now. So good. He is so precious, Laura!!!! Does his hair have a red tint?!!! And we are crawling now too, way before big sis did! Welcome back, we missed you! A two week vacation sounds amazing, I had a 10 day vacay and it was quite fabulous! Lil Finn is so adorable, your comment on breastfeeding gymnastics made me smile! He is so cute! I love all of his little nicknames :) I remember Odette started crawling right around Christmas last year and we had to hide the presents because she kept trying to open them lol. Love his fuzzy hair and all of his cute nicknames! So glad you guys had a great vaca, but also glad you're back - I missed you around blogland! Sorry to hear he may have a dairy allergy. And too bad you didn't get the amazing sleeper with the second child as we all secretly hope for when the first one isn't. Watch Liam and Finn will be the best sleepers ever in high school when all you want is for them to wake up! I swear he gets more and more cute by the day! And he's getting so big! I love the hair... it looks almost red! Oh my gosh, he is just the cutest little thing. I feel you on the sleep. We aren't getting a ton of it around here. Some nights I feel like a human pacifier. 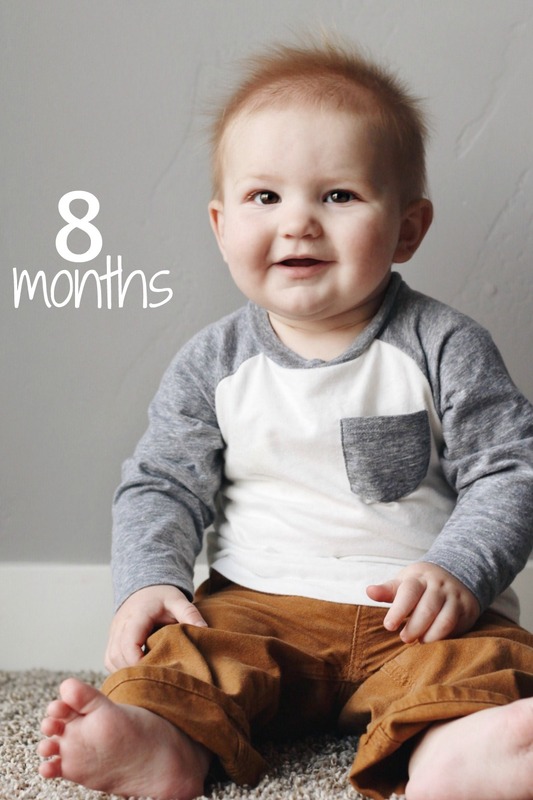 Happy 8 Months to Finn! What a little cutie! Are those wisps of red?!? They are! Liam was born a strawberry blonde (as was I) but he turned full on white blonde pretty quickly. Finn's red is sticking around... Perhaps we'll have a ginger in the family!